Ecstasy treatment demand is a relatively small group in addiction care with a share of less than 1%. Ecstasy is much more common as a secondary substance than as a primary problem. Half of the people requesting treatment for ecstasy-related problems in 2015 are new in addiction care. 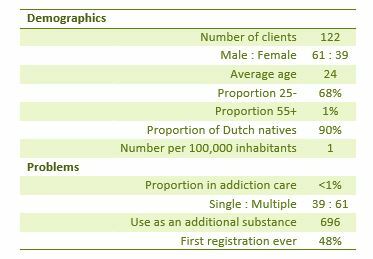 Ecstasy is a very small group in addiction care in the Netherlands. The drug is much more common as a secondary substance with other primary problems than as a primary problem.